In contrast to Nintendo’s Wii remote, the Radio Baton uses very basic technology: FM transmitters in two batons coordinate X, Y, and Z position relative to a surface. 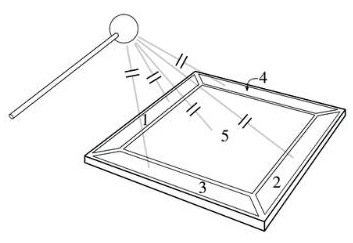 It’s an idea that’s indebted in some ways to the Theremin, and like the Theremin creates the challenge of performing without physical resistance or feedback on your location (well, unless you count air and looking at the surface, respectively). The payoff, though, is freedom of gesture and expression. Unlike the Wii, too, the two-baton system lets you control balance of instruments; the Wii does tempo only. I don’t know whether Nintendo’s engineers were familiar with this device; I’m assuming not. But Mathews certainly has proven to be ahead of his time, as millions of mass-market devices executing basically the same idea ship worldwide in the fall. 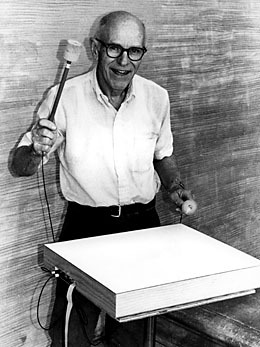 The Radio Baton was probably the first real baton controller, derived from Max Mathews’ early “Daton” controller which sensed X/Y position by impacting the surface (so, therefore, not really a baton so much as a kind of digital drumstick). But it was not the only such device. As reader Crix points out, you shouldn’t miss Buchla’s Thunder and Lightning controllers, designed by legendary synth designer Don Buchla and apparently still available for sale. (The website promises a new Lightning III model, but I can’t find details on it.) At last check, they cost about US$2000, but they have gotten artistic use, notably by San Francisco interactive performing artist Pamela Z. Unlike Mathews’ design and the Nintendo controller, the Buchla batons support only X and Y positioning, not 3D space, though they can coordinate the position of two batons at once. Despite that, the Buchla’s engineering principle is closer to Nintendo’s: a receiver positions the devices in X/Y space based on transmitters in the batons. The Wii controller likely coordinates internal sensors (gyro and/or accelerometers) with IR, because Nintendo’s product shots clearly show an IR window in the remote, just as on a TV remote, and a long bar acting as a receiver placed in front of the TV. The long bar would be necessary only if Nintendo were using the IR data as a way of coordinating exact position in X/Y space. So there you have it: your US$30 (or whatever it will cost) Nintendo remote uses the same technology used by experimental artists in a US$2000 system from one of the great pioneers of electronic music. Who would’ve thought. Mathews and Buchla are just two among many others who have done something like this; see the article below for an extensive history of alternative controllers, current as of 1999, by Joseph Paradiso, noting a number of other batons (along with lots of other interesting controllers). Now you just have to add Nintendo to the mix. I’m sure there are more, so chime in!